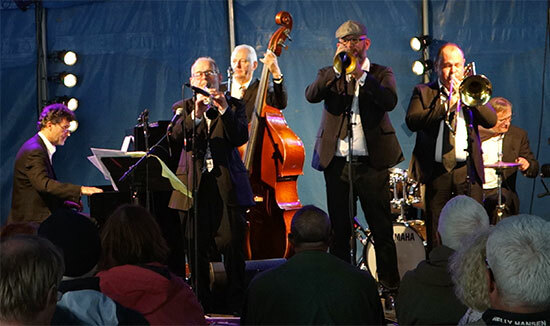 Launched back in 2005, Fest Jazz, Châteauneuf Du-Foau, was the inspirational brainchild of Brittany’s “Good Time Jazz Band”. Led by Fest Jazz Organiser Trevor Stent (above on clarinet), “Good Time Jazz” features six superb musicians, two English and four French. Formed in Brittany in 2002 the band combines simplicity, elegance, swing and panache, appealing to young fans as well as to greying aficionados. They play a refreshing and contagious mix of jazz and swing from the 1930s and 40s. joined them for “Bogalusa Strut”.